There are many different ways of defining sustainable and it is been said that there are over 200 definitions of sustainable development alone. The United Nations in 1987 described sustainable development as “meeting the needs of the present without compromising the ability of future generations to meet their own needs” and this perhaps outlines what it should mean to us within the construction industry. 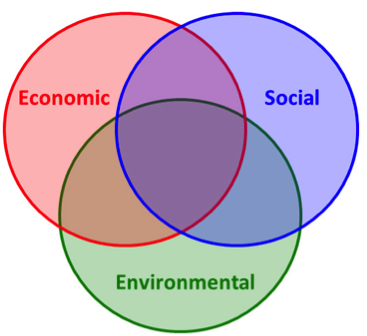 A common model for understanding sustainability is the “three pillars model” which was first introduced during the 2005 World summit on social development as a way of visualising the key components of sustainable development. This is a useful image as it provides us with a clear visualisation of the balancing required and that for truly sustainable development we need to address all three. 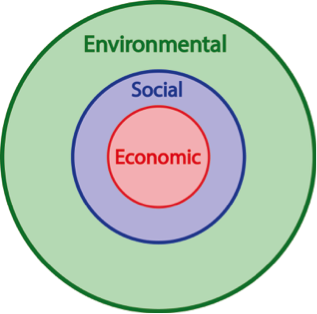 Whilst the three-pillar model is a useful tool for simplifying and visualising sustainability, it is slightly misleading in that it implies that the weighting between the pillars is equal, but as environmental ecologist Herman Daly sates “What use is a sawmill without a forest”. Buildings should be focussing on minimising their negative environmental impact and it is up to us as designers to find solutions that work socially and economically. Making sustainable solutions work socially revolves around opening people’s minds to new ideas and approaches. As humans, we are naturally sceptical and resistant to change, but this is the stage that we are currently at as the word “sustainable” is becoming more of a “buzz word” and the increasing global awareness is a key driver. A perfect example of that demonstrates we are on the right path is the recent Paris climate change agreement. In addressing the environmental and social aspects of sustainability, one would hope this would be sufficient to address any economic issues associated with sustainable buildings, by reshaping the way we approach building design, by finding simple solutions that are economically viable.